Call your local or get down there! If you're in the US and still trying to get a Switch, it's potentially been a struggle to find stock; various retailers have often offered sporadic and limited availability. According to CNET, though, GameStop stores in the country will have a notable restock today (15th August) and tomorrow. CNET quotes a GameStop representative confirming that every store in the US (around 4,400) will receive a minimum of 5 units; a nationwide top-up like that is rather uncommon. The stores are due to receive the units today and will put them on sale no later than tomorrow. It's possible that some stores will put them straight up on 15th August, but others may take a day and place them on shelves on 16th August; we've published this shortly before stores are due to open. It's worth noting that the stock-up is in stores only, and not on the website, so you'll need to head down to your local or give them a call to get a status update. It could be a good chance to get a Switch at its recommended retail price of $299.99, as opposed to the bundles pushed on GameStop's website and in other stores. Are any of you in the US going to try and secure a system? With thanks to Donni for the heads up. I know a few people here in the North of Ireland struggling to get them. Grey was available briefly over the weekend but they really want the neon unit. Good luck everyone, hope some people on here get one. @MartyFlanMJFan Come down to the republic, we have tons of grey ones all over the country. Strange - here in Germany I see a lot of Switches - last Friday there was a pile of at least 60 in one store. If I were a Japanese I would order one from Germany and pay delivery costs instead of waiting in a line with a ridiculous chance of getting one. More Switch consoles on the shelves = more happier gamers. Best enjoyed on the Switch! This game will make me finally bring it out with me (I don't have Zelda yet. I bought that for my li'l bro). Just buy from Amazon. UK site has them in stock anyway. Good im so glad the more the better i would love to see everyone young and old and everywhere inbetween get one. Games are meant to be fun ingaging and thought provoking and yes (quote from BBT ) shed a tear or 2. Nintendo for me and many others world wide even ones who wont admit it is by far worth the money and effort to obtainting this jewel of a system. Great luck to all who want and those who need a Switch i hope to see you all online playing at some point. I know this is totally uninteresting for most of you, but for once during a Nintendo release there have been zero stock shortages in Norway. It's actually such a stark contrast to what I hear and read about everywhere else that I'm starting to wonder if Nintendo of Europe simply has fallen in love with us or something. 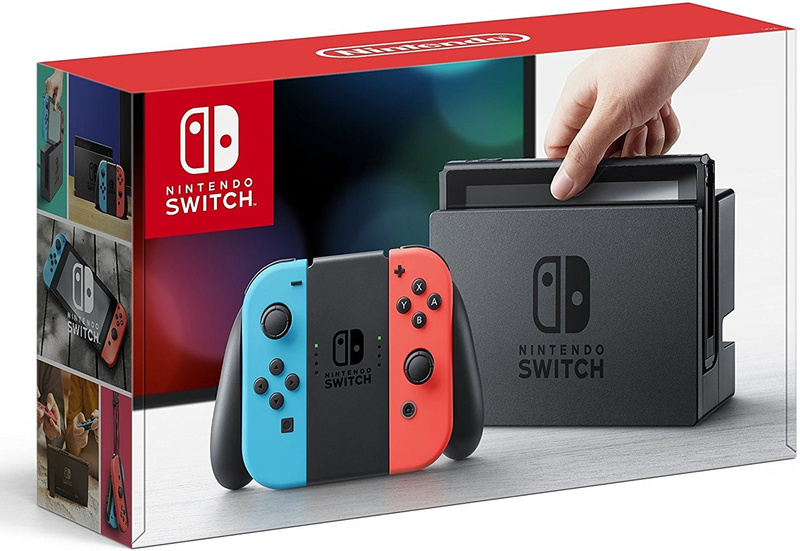 If anyone in the US wants a Switch, now's the time to get one. The shortages likely will only pick up again when demand for electronics skyrockets during the holiday season in a couple months. Gamestop also increased their trade-in values for older systems if you have one laying around you are willing to part with. Small print - today until Sunday. I've been planning on trading in my Xbox for a Switch but I'm not quite done w/ all the exclusives we want to play on it yet. But maybe we are. There is full of Nintendo Switches in stores and online in Sweden. We haven't had any stock shortages since around April-May. @andisart the surprising part is for the lack of imports, not for the lack of Switches in the (USA) market. @rjejr a couple months ago GS was offering $200 for a Wii U. Is it me, or have the general population kinda moved in and/or not really know about the Switch? I occasionally whip mine out in a few bars in Brooklyn (no sniggering please) and get people asking what is that? I'm sure their marketing will ramp up as we head into the US holiday season. I walked into BestBuy yesterday to get another pro controller and they had Switches in stock. Needless to say, I bought another. Now my kids and I can all play Splatoon 2 together !! This is going to be a huge restock, given how it will be the first time the Switch is readily available at all Gamestop stores since the platform's March 3rd launch. @gatorboi352 Why would anybody ever offer anything for a Wii U? Unless that was right after they said they were done making them? I'm up to about 150 hours in Zelda U with probably a couple dozen more to go so I wouldn't be trading it in anyway. Plus my kids still play a few other games on it as they await the inevitable SSB4 port. And in a couple of years they'll be old enough for Bayonetta 1 & 2. So we'll keep our Wii U forever. The Xbox just has Rare Replay and the Gears of War series and then it's out of here. And I won't miss that power brick light. Why anybody would put such a bright white light on a power brick I'll never know. Unless it's just so huge they were afraid of peopletripping over it. @HerroThar the stock situation in Norway has nothing to do with Nintendo of Europe, Bergsala distributes Nintendo products in Norway. I think it's interesting how easy the Switch is to find here as well, it doesn't seem to be selling well at all, unless Bergsala thought it would take off and made sure we got plenty. @AlliMeadow Yes, you are of course right! My bad. Yeah, I guess good judgment was involved. @HerroThar well, if it doesn't sell well, we could argue that it was bad judgement. Nevertheless I am glad I was able to get the Switch day one. I remember when the Wii came out and it took over a year before I could get one. @AlliMeadow Yup, I was lining up in the cold to get one. Either they've learned this time or the demand is actually lower relative to shipped units in Norway than in the US, for example. Switches for everybody!!! HEY! GET YOUR FILTHY MITTS OFF SCALPERS! Amazon UK won't ship electronics to the US. @HerroThar Yeah, let's hope so! Nice to se a fellow Norwegian here, there are too few of us on Nintendo sites. New Nintendo Wii U's are selling for around $800, even used they're selling for $200. Considering that they never released a replacement tablet controller and the low sales, they're going to end up being somewhat rare. @Maxtremors That's yet another reason not to trade mine in. Only console I ever traded in was my old PS2. I meant to get a newer model, then a PS3 w/ BC, then hoped for a PS4 w/ PS2 b/c, now I'm holding out for a PS5 w/ PS2 b/c. I have a couple of dozen PS2 discs that will never be played again. 80% of which I could play elsewhere if I wanted to. I think I've played a few on PC but they didn't run very well. Wii U will die w/ me or my kids. Though at the rate the Switch port machine is going we'll get to play most of them again if we want. It's ok if I never play Nintendo Land again. They're probably all bundles anyways. This is great news if you want to buy a used system passed off as new. Nope. It's confirmed these will not be bundles. These are straight laced $299 consoles. The website will still push bundles though, of that I'm sure. Australias the same. You can buy a switch just about anywhere. Was an initial shortage in April but not since. Nintendo hasn't really done much to market it. I did notice ebgames moved the switch gear over to the same wall as ps4 and Xbox this week though. It's a nice sentiment that it's worthy of feature wall status and not relegated to the back wall behind the second hand Skylanders as the Wii u before it. I've never seen one in a store. I've only seen one in person once. Glad I decided to wait. It's too small and I definitely made up my mind to wait for the inevitable XL model that will arrive eventually. @Captain_Gonru But it was 12 minigames, and yes 3 of them were good, really good even, but that means 9 of them weren't. Well 6 really weren't much more than mobile games, that F-Zero 1 in particular was horrible. So was Balloon Flight and the DK one. They would have been fine as free apps, but they weren't the stuff you launch a home console with and charge people $50 more to play it. That's NL's legacy. Had The Wii U launched w/ NSMBHD and NL was extra, fine, just like 1 2 Switch is separate, they didn't have a $350 Switch bundle w/ 1 2 Switch bc/ they know it didn't help the Wii U's rep any. So it's not so much that NL was bad, it's the whole - Let's launch our $350 console w/ a minigame collection and have "asynchronous gameplay" as our marketing slogan - thing. Yes Switch launched w/ 1 2 Switch, but it also launched w/ Zelda. Too much focus on NL. And no matter how good it was, are you really looking forward to buying the port on Switch? Or the 4k version? It's had it's time. Wii Play had it's time too. off-topic - finished season 4 of AoS tonight, my wife and I agree it was better than season 1. That's all I'll say until you catch up. Going on vacay in a few days for about a week so you'll be spared comments for awhile. @NintendoPete Doubtful. They are probably display boxes stacked for display purposes. I've seen similar displays with a sign "in stock soon"! I think the stock is pretty close to be met in the US. I'm sure there are some parts that are out of stock. But we've had stock in my city the last three weeks. Until then all stock sold within a day or 2. It's not a matter of them begin bad or good, it's a matter of selling a $350 console based on what look and play like free mobile games. Pac Man, Space Invaders and Tetris are some of the most popular games of all time, but if the PS5 launched w/ a bundle of those 3 in 4k as it's selling point, well that's a bad selling point. OK, I'm leaving for vacay now, enjoy the show. @Captain_Gonru @Captain_Gonru Anniversary of your Wii U purchase? Congrats. My wife and I celebrated 20 years last week, not of marriage, from our first blind date. We had half a bottle of sangria, that was about it. So anyway, on the TV front, since it's been awhile, 3 episodes left of Cage, then we start Defenders on Saturday, so I just realized I need to watch 10 eps of Iron Fist by then. So I watched ep 4 tonight - yes I know you warned me about spoilers - and it was actually ok, can't really go wrong w/ both The Hand and the Triad. I don't think I can stomach 3 a day for the next 3 days though, so I'll have to start Defenders and watch the end of IF later. I finished Zelda Monday night - beat Ganon - had 115 shrines and about 260 Korok seeds and finished most of the side story lines - Tarrey Town and Kas the musical Ruto. I'll play Champions Ballad but wont' go back to it before then. Still waiting on Mario for Switch. About 4 or 5 games today looked good but nothing I'd pay more than $5 for so no rush. Games really stress me out too much these days, I fear for my health, so TV is taking up more of my time. You ever finish Shield? Inhumans is in Imax this weekend but we'll wait until it hits TV, why pay for what I can get free 4 weeks later? Need to save movie money for Thor and that Jedi movie. @Captain_Gonru So have you watched all 8 Defender eps? I watched episode 5 of IF today, the one with lunch with Claire, then she saves that guy with the credit card, then she gets to tell them off about The Hand. Definitely the best so far, Claire needs to become Spider woman, not SpidrrGwen, or something. Which reminds me, mutant TV show with somebody's son, Reed Richards, Charles Xavier? While I have both Hulu and Netflix. Ok, so when can I watch Defenders? I have 2 Luke Cage left, then 8 IF? I'll finish Cage before IF, keep myself busy with Ballers and I'm thinking about Preacher. I hear you about waiting on Inhumans, you watch all 4 CW shows right? Since we only watch Arrow and Flash we have more time. And it may be 18 months before GoT comes back. But when it does, 67 eps in 67 nights. My wife and I saw the preview trailers for that on the CW app on the Xbox - pretty much our streaming box these days until I sign up for the Play Pass for GoW2 and 3 - and both said, nearly in unison - "Uh, no." Watched ep 6 before of IF w/ my wife. Even when it's good - IF battling the 3 stooges - it's still bad. But Lady Gau Mau certainly seems important, and Claire. So I'll try and watch 6 eps of IF in the next 2 days and explain it all to my wife - she couldnt stand 3 seconds of Ward and his painkiller addiction, that guy just isn't a very good actor. Thanks again for all the help. Life is hard when you have kid s- 1 was home sick all day on the couch, the other found out he has yet another cyst in his jaw that needs removal, and the oral surgeon gave me a hard time for not getting him back there sooner - we were just at the dentist on Monday and the orthodontist last Wed, why does my kids mouth need so many doctors?!?! So now I'm paying $1,500 a year for him for sword fighting lessons b/c I feel so bad for him. And his bar mitzvah is in January. Just in case you thought my post shave been off the past few days, they have. I need more Brockmire. Or at least Westworld. I dont' think videogames are doing it for me any more. @rjejr Ok, so I watched 5 eps of IF yesterday and the last 2 today. Show turned out to not be too bad though Danny, Ward and the dad I still don't like. And they really watered down Madam Gau. She stood up to Fisk and DD, now she's just all talk. But overall the show did get better as it morphed into Arrow and the Black Canary - Claire - which I guess makes Colleen Speedy sort of. It ended better than Cage did, that whole last ep was off with the fight and everyone leaving, I wasn't too happy with it but overall the show was good. Seems like the toy industry is trying to tell us something, everybody spending their money on phone and tablet apps maybe? Though TRU having financially difficulty is nothing new, they're practically a Trump company in that regard, but add that to the Lego news and it started to look like it could be something bigger. Well hopefully you're good.